I found out about the Discover Seoul Pass when I talked to a Korean Tourism Organization representative who attended a Filipino event in Seoul last June. At first, I didn't really care about it as I always want to plan my own trip, but when I read more about it, I realized that it is a brilliant idea from the Seoul Metropolitan Government and the Seoul Tourism Organization. After 2 weeks, I finally decided to try it out. 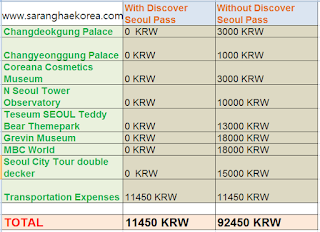 I can't believe the great deals a person can get out of buying the Discover Seoul Pass. There are two options to choose, the 24 hours and the 48 hours. This pass will allow you to visit 21 tourist attractions in Seoul for 24 hours and 48 hours respectively! There's also a Discover Seoul Pass application that will provide you the list of 21 attractions to visit and will automatically mark the ones you have visited. Aside from that, the tourist information center also provide a brochure where you can see the directions and the address so you can easily locate the places you want to visit. I bought the 24 hours Discover Seoul Pass which only costs 34, 900 KRW, it is a discounted price from 39,900 won because of the summer sale. I was so excited when I checked out the list of the places I can visit for free and with discount using my pass because I've never been to those places yet. I immediately planned my 24 hour itinerary. The good thing about this pass is that, it will never start unless you logged in your first visit. So after you bought it, you can have all your time of the day to plan your trip. Obviously, I can't visit all 21 attractions in 24 hours. In order to maximize my 24 hour pass, I made an itinerary for myself including the time and the directions. I also diversified it by selecting only 1 or 2 attractions per categories just to save me some time and to make the trip even more productive and fun. 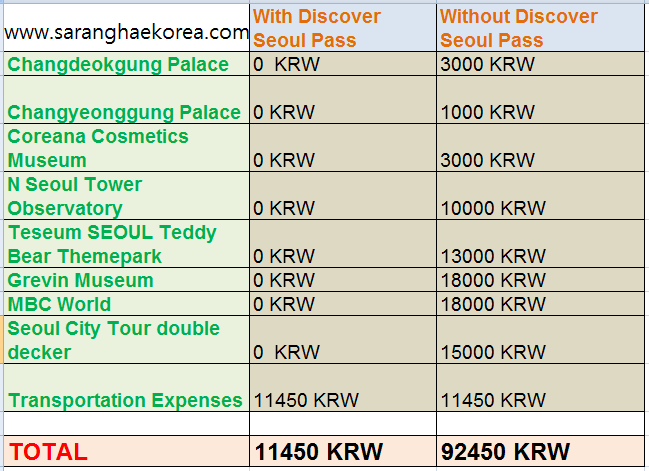 So I am going to share to you my 24 Hours Discover Seoul Pass itinerary and I also included the actual entrance fee and the transportation fee so that we can compare later on how much we can save if we use the Discover Seoul Pass. I started late because I had an errand in the morning, so my itinerary will start at 3:00 PM. Information: There's a subway station near the Myeongdong Tourist Information Center where I bought the 24 hour Seoul Pass. Take that station and take Line Number 3 (orange) and get off at Anguk Station. 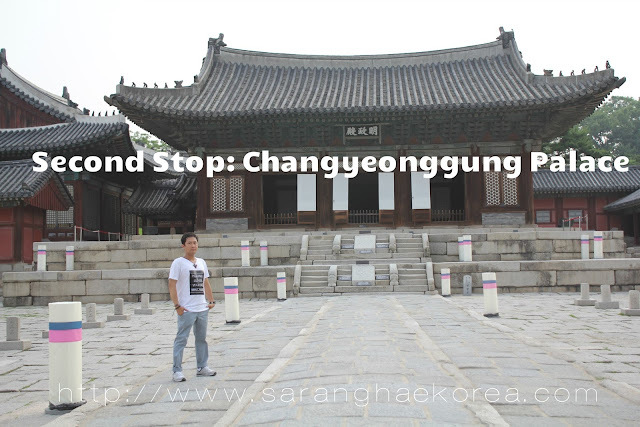 Go to Exit 3 and walk straight until you reach the Changdeokgung Palace. Information: One of the 5 grandest palaces in South Korea. I've been to Gyeongbokgung so many times but never been to Changdeokgung Palace. Although it's not as popular as Gyeongbok, I think I like the Changdeokgung because it has a "foresty" feel due to the trees and the environment where it is located. Information: Just beside Changdeokgung is Changyeonggung Palace. You don't need to take public transportation to get there. All you need is to go to the direction where the Secret Garden of Changyeonggung is located. The entrance to Changyeonggung Palace is just beside it. Information: Although Changyeonggung has quite the same characteristics as in the Changdeokgung, it offers a different kind of taste to its visitors. The ambiance is more relax and refreshing and I think there are other elements added to the regular architecture of a palace like ponds and arch bridge and whatnot. Information: When you go out of Changyeonggyung Palace, there's a bus stop waiting for you. Take Bus 301 from that bus stop and get off at Apgujeong Station. If you notice, my travel time took almost 45 minutes because of the traffic. But I can forgive that because I was tired for visiting two palaces, so this would be a rest time also. At Apgujeong Station, you must go to Exit 5 and walk towards the Space C Building where the museum is located. You may need to navigate the address of this museum on Google Map because I found it hard to locate the building. Information: There's not much to see in this museum except for the traditional beauty products and instruments of Koreans. 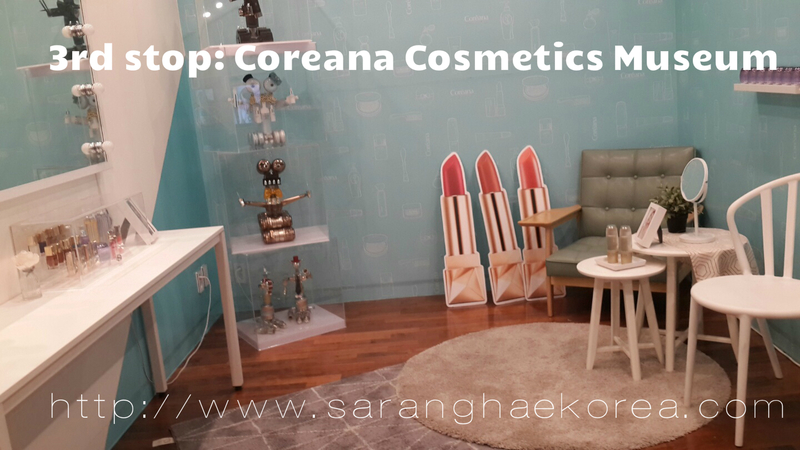 You will see how cosmetics evolve through this museum. Although I was personally disappointed because it's not allowed to take any photo inside the museum and I just can't relate to what I saw inside, maybe because I'm a guy, but if we talk about knowing Korean culture, cosmetics should be included. So yeah, a little visit would do it justice. Information: The good thing about Coreana Cosmetics Museum is that it is located in Apgujeong where shopping street is located nearby. You may want to walk around and have some food before going to the next location. Information: From wherever you are, go to Chungmuro Station, go to exit 2 and take Bus Number 2 to Namsan Tower. Information: The reason why I put Namsan Tower at this time is because it's the only attraction that opens at this time and I want to experience going there at night time and I didn't regret my decision. it is very beautiful up there especially when you view the city lights from N Seoul Tower Observatory. It's ironic though because when you are down in the middle of the city, you can see the tower with its beautiful and colorful light. But when you are up there, you'll see even more beautiful view from down below because of the city lights. 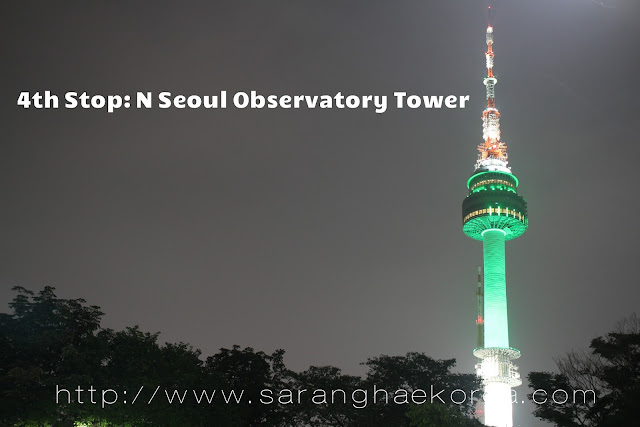 You can stay up there until 11 pm because there are a lot of things to see and do aside from the N Seoul Tower Observatory. Information: I chose this as my first itinerary of the day because out of the 21 attractions, this is the earliest to open in the morning. This themepark is just right at the Exit 6 of Dongmyo Station on Subway Line number 1 or 6. The moment you go out of Exit 6, you will be greeted with cute bears right outside the building of Teseum. I enjoyed my stay at Teseum because the teddy bears are just so cute. Information: The Grevin Museum is located very near the Exit 5 of City Hall Station on Line Number 1. Although it's only a 10 minute travel via subway, you must give it a little time allowance because taking a train from Dongmyo Station is a little bit of a challenge because it's a big station. Information: Do you want to meet Lee Min Ho? What about Bruce Lee? Madonna? Angelina Jolie? Or even Steve Jobs and Albert Einstein. Grevin Museum is a star studed museum as it features the wax figures of famous Hollywood celebrities, Korean actors and actresses, kpop idols and even the Korean personalities all the way from the Joseon Dynasty. 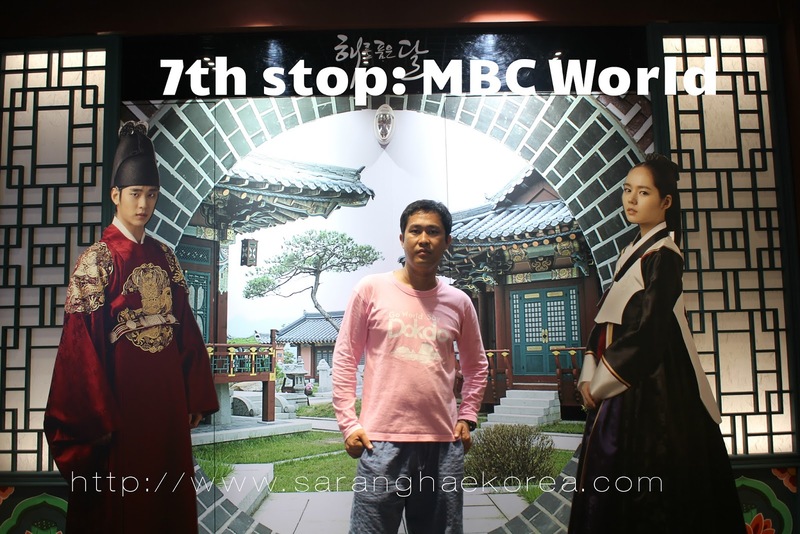 Information: MBC world has three zones, the M, the B and the C. Each zone has different activities that could let you interact with the different Korean dramas and TV shows like news and reality shows peoduced by MBC. So if you are a kpop fan or a Kdrama fan, MBC you will definitely enjoy MBC world. Information: Take the Bus Number 18 to go back to Digital Media City Station, take the subway and get off at Dongdaemun History and Culture Park. Go to Exit 1 and walk straight to the street, you will find a city tour booth there. 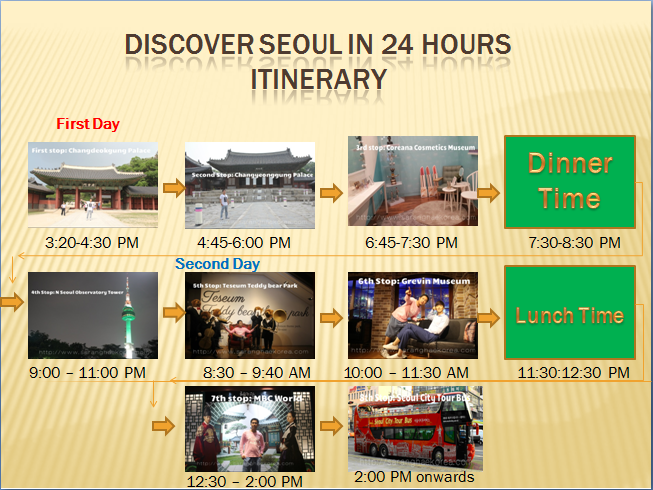 Present your Discover Seoul Pass for Seoul City Tour double-decker. Information: You can get on and off the Seoul City Tour as it shows you the beauty of Seoul all at once. You can take the tour until evening the last schedule if you want. And that end, the 24 hours validity of my Discover Seoul Pass. Let's see the breakdown of the places I visited and let's compute how much I spent with my pass and how much I am supposed to spend without the pass.